Liberal leader Justin Trudeau has announced that, effective immediately, he has released all Liberal Senators from the party's national caucus. 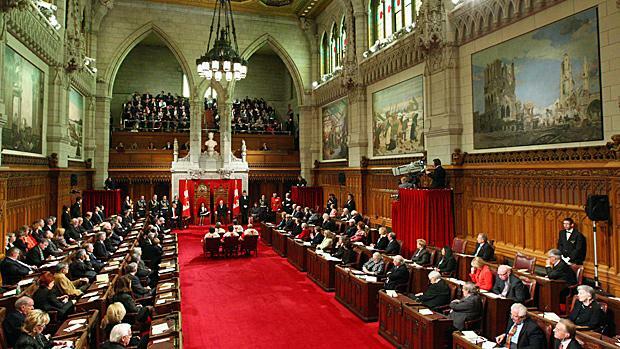 The 32 formerly Liberal Senators will now sit as Independents. "The Senate is broken, and needs to be fixed," he told reporters, unveiling his plan for the red chamber. "At the same time, Canadians do not want to re-open the Constitution. They don’t want a long, rancorous, and likely pointless debate with the provinces that would distract us from focusing on more important problems. I have come to believe that the Senate must be non-partisan. Composed merely of thoughtful individuals representing the varied values, perspectives and identities of this great country. Independent from any particular political brand. "And since I believe that real leadership is not just about making campaign promises, I’m taking immediate action, today. As of this morning, only elected Members of the House of Commons will serve as members of the Liberal Caucus." Reaction from the affected Senators was mixed with some pleased and others clearly upset. But former Liberal leader in the Senate James Cowan told reporters that he was still a Liberal and that the now-independent caucus will still work together as the "Senate Liberal caucus." Trudeau said that phase two of his plan would take place after he becomes prime minister: Should that happen, he says he will implement a "transparent, non-partisan public process for appointing and confirming Senators." "No more closed doors. No more secretive deliberations. No more announcements the week before Christmas, under the cover of darkness," he said. Trudeau also challenged Prime Minister Harper to release the Tory caucus. "As the majority party in the Senate, immediate and comprehensive change is in Conservative hands. I’m calling on the Prime Minister to do the right thing," he said. "To join us in making Senators independent of political parties and end partisanship in the Senate." That idea, however, was quickly shot down by Conservative cabinet minister Pierre Poilevre who called Trudeau's plan a "smokescreen" suggesting that the timing of it was tied to the pending release of what could be a very damning Senate expense report by the Auditor General. "In reality, not only would his Senators continue to be non-elected and unaccountable, the only change is that they wouldn't attend one caucus meeting a week," he said. "On top of that, he's made a proposal that would make the Senate far worse than it is already is -- if you can even imagine such a thing. Under his proposal, not only would senators be unelected but those who appoint senators would also be unelected. That's not just one step from democracy but two." The New Democrats, on the other hand, lauded the Liberal leader. They put out this press release shortly after Trudeau's announcement. We welcome Mr. Trudeau’s decision to finally agree with our proposal from last October to “end Senators' partisan activities” and remove Senators from party caucuses. Regardless of the political reaction, the 'bold' move helps the Liberals finally stake out a position on the Senate issue in the midst of the scandals and diminishing public support for the once respected body. The Tories prefer reform through their Bill C-7, a controversial piece of legislation which would incline provinces to hold senatorial elections and impose a nine-year term limit for senators. The New Democrats want the Senate abolished. Trudeau said that his plan offers Canadians a better option.